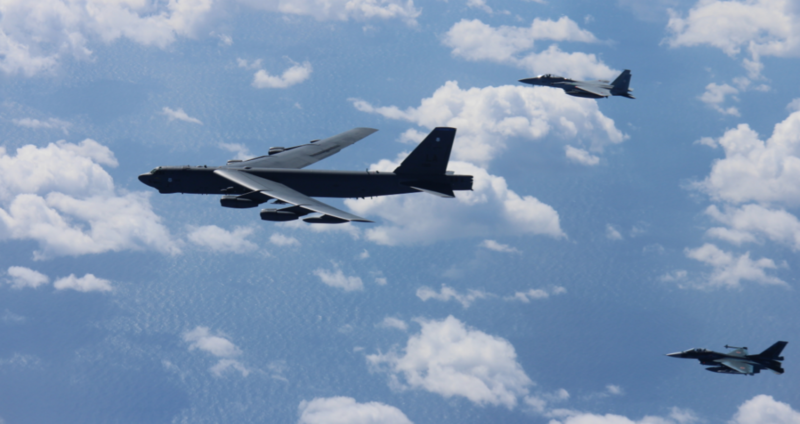 The US Pacific Air Forces released photos on Thursday showing two Japanese fighter jets escorting a US B-52 bomber across the East China Sea and the Sea of Japan earlier this week. According to the release, the US Air Force B-52H Stratofortress bomber and two F-15 fighters from Japan's Air Self-Defense Force took to the skies on Wednesday to "execute a routine bilateral training mission" in the region. A US Air Force B-52H Stratofortress bomber and two Koku Jieitai (Japan Air Self-Defense Force) F-15 fighters execute a routine bilateral training mission over the East China Sea and the Sea of Japan, Sept. 26, 2018. "This mission was flown in support of US Indo-Pacific Command's Continuous Bomber Presence operations, which are key to improving combined interoperability, tactical skills and relationships," the statement reads. "These missions are consistent with international law and the United States' long-standing and well-known freedom of navigation policies." 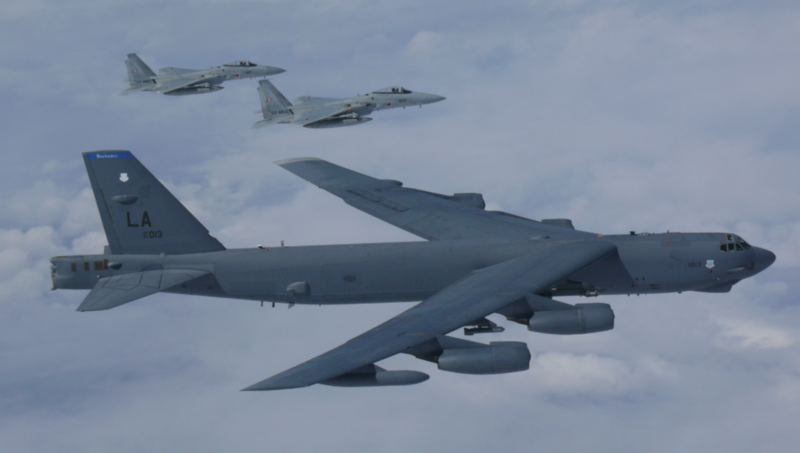 After departing from Andersen Air Force Base in Guam, the American bomber participated in training exercises near the East China Sea before joining up with 12 Koku Jieitai F-15s and four F-2s in the Sea of Japan for "multiple integrations." The US' Indo-Pacific Command has been running bomber operations in the region since March 2004, the statement went on to say, stressing that the practice is "consistent with international law." 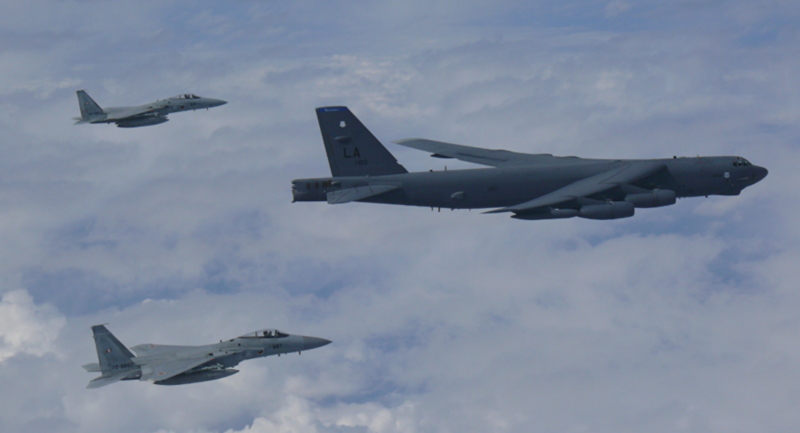 Prior to the Wednesday operation, another four US bombers traveled through the skies over the South China Sea on Tuesday. According to Business Insider, B-52s flew through the South China Sea on Sunday as well. It was previously reported by media outlets that during the training operation over the East China Sea, both Japanese and American forces flew near the uninhabited Diaoyu Islands, which are controlled by Japan, but claimed by China as its own. US Defense Secretary James Mattis told reporters at the Pentagon earlier this week that the flights were really "nothing out of the ordinary" and have only become a hot topic due to China's move to militarize the contested region. "If it was 20 years ago, and had [China] not militarized those features there, it would have been just another bomber on its way to Diego Garcia or wherever," he said. Diego Garcia, the largest island of the Chagos Archipelago, is used by the US as a military base. The September operations come after the US sent various aircraft, including B-52 bombers, through skies above disputed waterways multiple times in August.